No longer do you have to suffer from hard unforgiving stages. Wooden Kiwi Productions now stocks sprung dance flooring for temporary installations in theatres, recital halls, banquet halls, tents, et al; we are the only rental company in New England to do so. 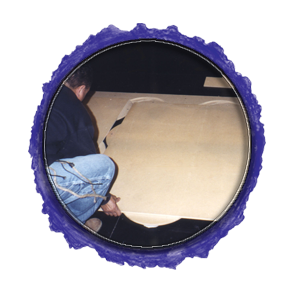 We stock the Rosco Subfloor, a unique patented system of panels that lock together using the exclusive WaveLock Technology that requires no hardware to join panels. Each panel is 42" x 42" x 2" tall and weighs just 40 pounds. They are furnished with a solid perimeter 4 3/8" wide and transition ramps, if desired. Shipped on convenient dollies that will fit through any standard doorway, they stack, store, and install quickly and easily. For more information, please download a Rosco SubFloor Specification Guide. As a top surface, we also stock both Black/White and Black/Grey Marley for rental. We stock the Rosco Dance Floor, in rolls 5' 3" wide and from 17' to 40' long, plus we have some additional Marley available for custom installations. Marley is available with or without rental of a sprung floor system, and either with or without delivery and installation. We also can and routinely do ship rental marley nationwide. To install your own rental marley, please read our installation instructions We also stock Black Duron, an excellent surface for tap, flamenco or step dance. PLEASE NOTE: NO RENTALS WILL BE HELD WITHOUT A SIGNED CONTRACT AND DEPOSIT. Prepayment by check or credit card is required. University Purchase Orders will also be accepted.